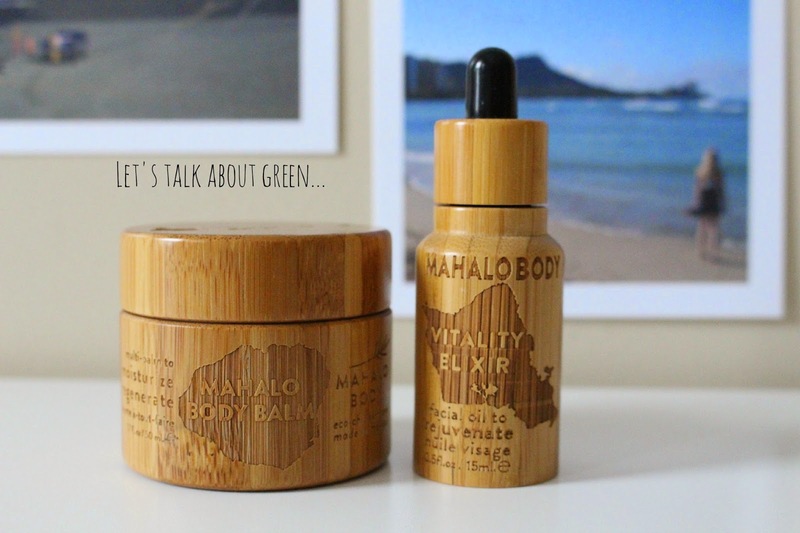 Let's talk about green..: A natural brand from Kauai, Hawaii : Mahalo Skincare ..
A natural brand from Kauai, Hawaii : Mahalo Skincare ..
Voici un de mes gros coups de coeur en ce moment : Mahalo Skincare. Je n'utilise pas ces produits depuis longtemps, mais l'amour a été instantané. La packaging est vraiment hyper joli et la composition des produits est faite avec de super ingrédients de qualité. J'ai aussi posé quelques questions à la fondatrice Maryna.. L'entrevue est au bas de cet article. Here is one of my coup de coeur right now : Mahalo Skincare. I have only started to use these products recently, but love came instantaneously. The packaging is just beautiful and the product composition is made of super high quality ingredients. I have also asked a few questions to the founder Maryna... you will find the interview at the bottom of this article. Une huile composée d'ingrédients exceptionnels ; dont en première place dans la composition, l'huile de tamanu, une huile de très grande qualité qui a des propriétés antioxydantes élevées, désinfectantes et cicatrisantes. L'huile de Kukui quant à elle est une huile calmante qui pénètre profondément et rapidement dans la peau, elle a des propriétés régénérantes et restructurantes (plus info ici). La liste d'ingrédient est ci-dessous pour constater que ce mélange est de toute beauté. J'utilise cette huile depuis une dizaine de jours et je suis sous le charme. Je vous ferai une mise à jour sur mon avis après une utilisation à long terme dans un autre article. This is an oil that is made with exceptional ingredients : the first ingredient in the list is Tamanu oil, which is of great quality and has high anti-oxidant, antiseptic and healing properties. Kukui oil is a soothing oil that penetrates deeply and quickly into the skin, with regenerating and restructuring properties (more info ici). The ingredient list below will make you realize that this is a wonderful mixture. I have been using this oil for roughly ten days now and have been charmed. I will give you an update after a longer usage in a further article. Ce baume est hyper hydratant et réparateur. Il faut dire que présentement il fait -30 au Québec, donc j'ai eu la chance de l'essayer dans des circonstances extrême. J'en ai appliqué sur le dos de mes mains et aux endroits ultras secs (ventre, hanche, bras). Une odeur très douce, réconfortante et très florale/lavande. This balm is super hydrating and repairing. I have to say that temperature right now in Quebec is around -30, so I really had the chance to test it in extreme conditions. I applied it on the back of my hands and in very dry areas (belly, hips, arms). The smell is very soft, comforting, witb a floral touch of lavender. MAHALO BODY is a soul child of my (Maryna’s) fervent yearning to expand the limits of experiencing the beauty of our raw self, our bodies, our skin. To feel the euphoric uni-song of body and soul. To touch and avail oneself in the Earth’s luxuries, being literally absorbed onto our skin - a tangible love. MAHALO BODY is a Hawaiian enchantment that goes beyond delectably exotic skincare to be an inspiration for indulging in a sacrament of self-care….to fall in love with your self - every day. In inspiring you to be deeper enthralled by your beauty, MAHALO BODY products offer simple indulgences in eco-chic skincare that are intentionally designed with artisanal beauty and ingredient integrity. Our potent bioactive blends of organic botanicals, precious super-oils, exotic extracts, antioxidant-rich plant butters, and Earth minerals cocoon you in the opulence of Hawaiian sun, the dew of tropical mornings, and the life-giving force of volcanic land. The sophisticated performance is achieved without preservatives, synthetics, parabens, harmful chemicals and animal testing. Stop the time. Alleviate stress. Unveil your glowing, paradise-radiant self. “Mahalo” is an ancient Hawaiian word of gratitude, esteem, and respect. When you use MAHALO BODY, you engage in a ritual of thankfulness for the manifold gifts of your body, your spirit, and the Earth. To be fully honest - the world does not need yet another skin/body care company. There are some awe+some and amazing lines already on the market today. What we need is to be inspired, to be shake-up to re-ignite our passion for life, the adoration for ourselves and to expand ourselves beyond our perceived limits - to activate ourselves to our fullest potential. Besides making 100% pure, luxurious products, I am inspired to inspire women (and men) to awaken to our raw beauty, to fall in love with ourselves every day…to take conscious moments to nurture ourselves. If our bodies are our temple, then the conscious moments we take for self-care are the our sacraments of self-love. When we engage in the MAHALO sacrament of self-love, we connect to our heart through our body, our skin. Connecting and balancing inner life with the outer life - getting to that joyful point where we will do no harm, not create damage or destruction around us = we will cherish and be inspired by life. The celebration of life, the bliss of life. When we begin our day with a conscious moment of self-love, the MAHALO moment, we remain that beautiful being that we truly are - all day. The power of sacrament of self-love is to fly free like a bird into the freedom of possibility - and that is my goal with MAHALO BODY. 3. What is the ingredient that you enjoy the most to work with ? This is a very hard question, as I work with over 40 ingredients. To pick one is like choosing a favorite amidst one’s children (and yes, I see of my ingredients and products as my babies). But if I had to pick one it would be turmeric. It is a true powerhouse ingredient - from eliminating cancer cells, curing digestive issues, balancing the mind, calming nervous system, reducing inflammations and treating a plethora of skin conditions (including acne, eczema, allergic hives and even chicken pox). If plants were currency, then turmeric would be gold. I use it in all my products. In PELE MASK it comes as certified organic powder. 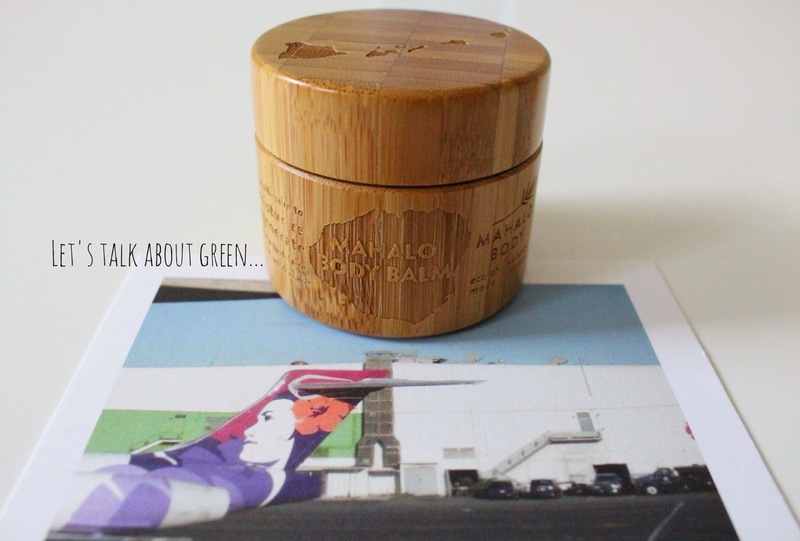 In MAHALO BALM and VITALITY ELIXIR it comes as organic supercritical extract. For years I had a soft spot for MAHALO BALM. I used it for everything - hair care, face cleanser, dry feet, (even chafing when I went hiking/biking). It really is all around fabulous. This was until I had a new “baby” - the VITALITY ELIXIR. My adoration for this face oil is inspired by it’s ingredients. Majority of the ingredients are organic supercritical CO2 extractions that are so potent and pure it’s as if you are touching the soul of the plant. Supercritical CO2 process is the most advanced way to extract the essence of the plant with the least possible damage to it’s cellular structure. We get our extracts directly from the source, making them fresh, potent and so fabulously luxurious. When I was developing the facial oil, my inspiration was to not only rejuvenate and nourish the skin, but to balance the mind and sparkle-up the mood. That is how the name VITALITY ELIXIR was born. Each ingredient was consciously selected to revitalize our skin and ourselves with the power giving continuance of Earth’s gifts. The base oil for the elixir is tamanu oil, which we get from the Polynesian islands (vs Vietnam) that due to volcanic atmosphere contains the most nutritional value. Our tamanu oil is one of the purest on the market, being light in color and aroma. This oil alone is a remarkable topical healing agent for acne and acne scars, eczema, psoriasis, stretch marks, age spots, skin rashes, general scarring, dermatitis through to anti aging and is a fantastic oil for all skin types (even oily). Tamanu is a luxurious and precious oil - it takes 100 kilograms of tamanu fruit, the amount that one tree produces annually, to yield just 5 kilograms of cold pressed oil! Natives believed the tamanu tree was a sacred gift of nature and that gods hid in its branches. It was their answer to skin protection from hot sun, high humidity and ocean wind. 5. Is there someone or something that gives you inspiration in your work ? My biggest inspiration is to know that what I do makes a difference for the better…that I am making a better Earth, better body, better self. That I am inspiring betterment and mindfulness in people. While also offering luxurious indulgences for the body and soul. I am also eternally grateful for my wonderful husband who supported me in birthing my dream into reality and who allows me to experience the limitless power of love. These two above mentioned aspects inspire me to leap out of bed every morning and to work tirelessly day after day in shaping MAHALO BODY. Being good to yourself is good for your self. Connaissiez-vous Mahalo Skincare ? Avez-vous déjà essayé ? Je vous parlerai bientôt du masque pour le visage qui a mon avis le meilleur masque que je n'ai jamais essayé!! 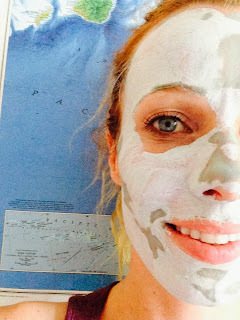 Very soon I will talk about the face mask which is, in my opinion, the best mask I've ever tried !! NB: Désolée, l'entrevue est effectué en anglais seulement, car je ne voulais pas traduire ses réponses et garder l'entrevue originale :) Si vous avez des questions parcontre, n'hésitez pas! Merci beaucoup, mahalo nui loa and thank you for taking the time to empower women to live a green and beautiful life. I am delighted that you are enjoying MAHALO treats. If you have any more questions - feel free to connect. Ils sont vraiment beaux les packagings!!!! J'aime la comparaison entre les ingrédients et les enfants! This brand sounds wonderful! The ingredients are lovely and I enjoyed the interview. Thanks for the introduction, I'll have to give them a look. Beautiful review Julie. Looks like such a lovely company that truly cares about their products as much as their customers :) Take me back to Hawaii! !